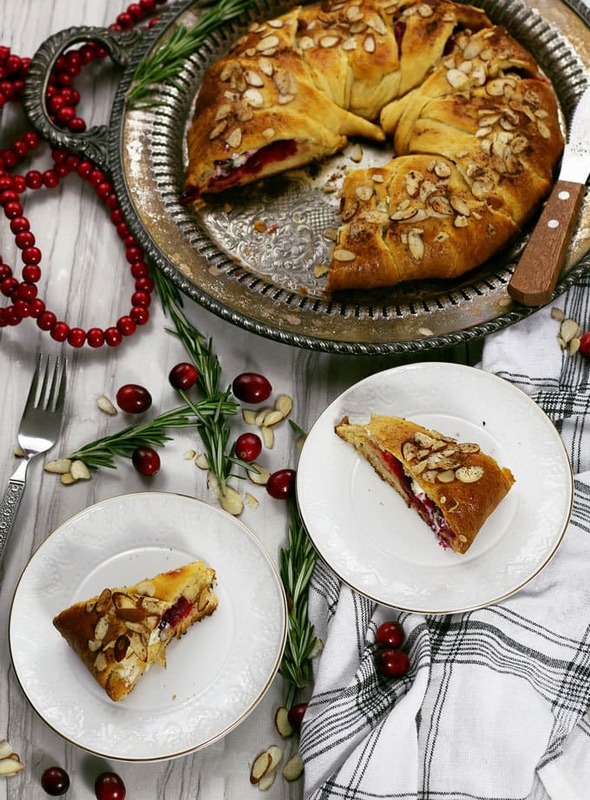 The holidays just got better thanks to this easy cranberry goat cheese crescent ring. It can be an appetizer or dessert recipe – it’s the perfect mix of sweet and tart! This post is sponsored by Pillsbury. All opinions and my love of crescent rolls are my own. The only season I like better than autumn is BAKING SEASON. There is something about the glorious smells that come of the oven once the weather gets cooler and the holiday cravings start to kick in. It’s addictive and I’m mildly obsessed with it. 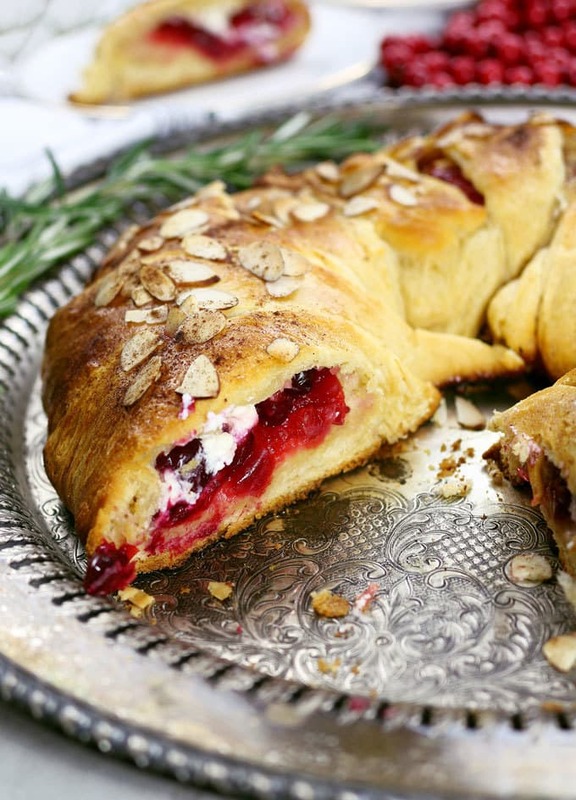 This year I am getting ready early with this cranberry goat cheese crescent ring. It is going to rock your holiday season. This delicious recipe can be an appetizer or a dessert – it is the perfect mix of sweet and tart. And it all starts with Pillsbury Crescent rolls. Pillsbury Crescent rolls have been a holiday staple in my family for years. We always serve tthem in a cloth lined basket, and we always run out. That’s a great sign. 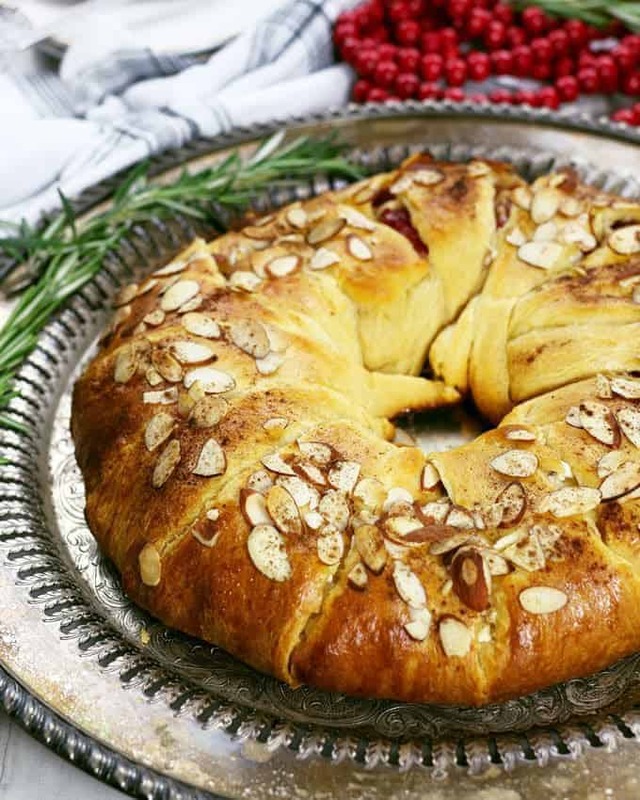 This year, I plan on switching it up by taking the roll out of crescent rolls and turning them into a crescent ring. I’m heading to Walmart and picking up as many Pillsbury crescent roll 2-packs as I can. Every party I throw is going to have this treat! Start by boiling fresh cranberries in water to soften them up. This only takes about 10 minutes and is a necessary step; don’t skip it. Drain out the water and set the cranberries aside. 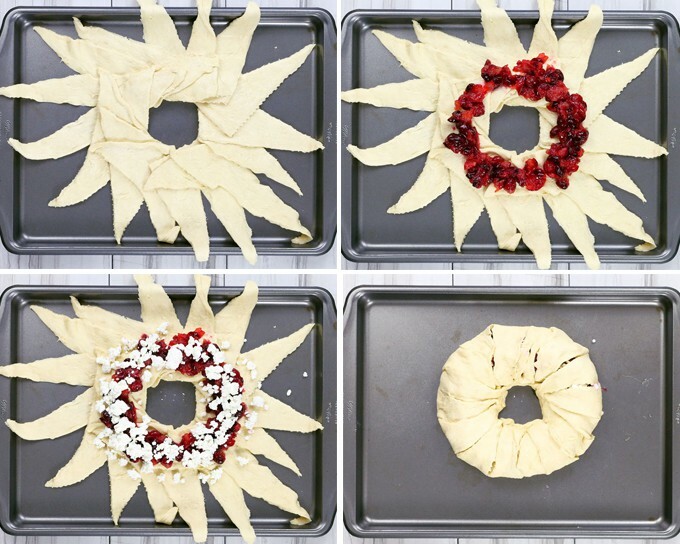 Next, roll out your crescent rolls and place them on a baking sheet so that they are in the shape of a sun with a hole in the center. I recommend rolling them all out first and placing them on plate. This makes the process easier. If it’s not perfect, don’t worry. Move the crescents around as needed until you have the sun shape set. Once that is done, spread the softened cranberries around the center of the ring. Top that with goat cheese and sprinkle honey all over both. Now it’s time to close up the ring. Bring each piece of dough over the filling and tuck the dough underneath. Everything should close up pretty tight but if a little filling squeezes out, that’s okay. 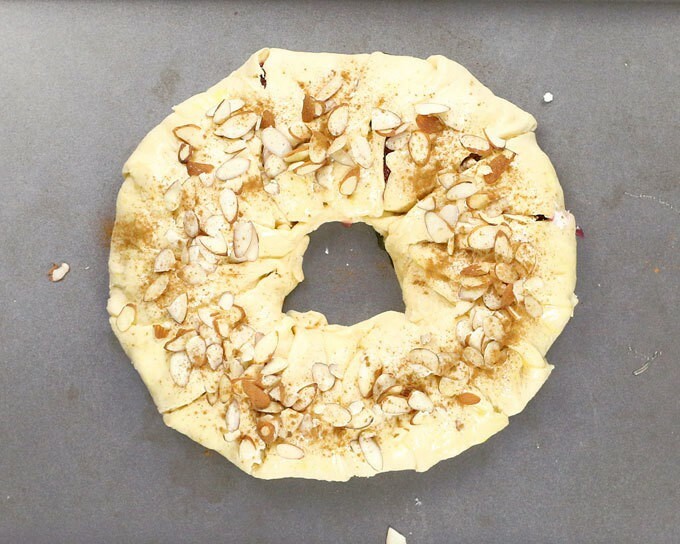 Brush an egg wash on top of the dough and then sprinkle almond slices and cinnamon on top. Time to pop it in the oven! As it’s cooking, you might hear some popping and bubbling. If you’re like me, you will start craving a piece of this ring at the first sounds. Hang tight though. When you finally remove the crescent ring from the oven, let it sit for 10 minutes before serving. Look at how juicy that cranberry looks now! You may want to serve this as an appetizer – it’s both sweet, savory and sure to surprise your guests. It would also be great as a dessert served with hot coffee. Either way, there won’t be any leftovers and you will probably want seconds. In a small pot, combine the cranberries and water. Cook on medium heat until the cranberry skins pop open (approximately 10 minutes.) Remove pot from stove and drain water. Set aside. Unroll both cans of Pillsbury Crescent roll dough. Separate the dough into triangles (use the perforations as your guide). On an un-greased cookie sheet, arrange the dough triangles into a circle. The dough will overlap and should look like a sun. Spoon the cranberry mixture around the dough, close to the center of the ring. Top with the goat cheese. Drizzle the honey on top of the goat cheese. Bring the dough pieces over the filling. Tuck the edges under the bottom of the dough to secure the filling. In a small bowl, whisk the egg well to create an egg wash (you can add a little water or milk to it if you like). Use a brush to apply the egg wash on top of the dough. Sprinkle the almond slices on top of the egg wash. Sprinkle the cinnamon on top of the almond slices. Bake for 20-25 minutes or until the dough is thoroughly baked. Cool 5-10 minutes before serving. Disclosure: This post is sponsored by Pillsbury. All opinions are my own. 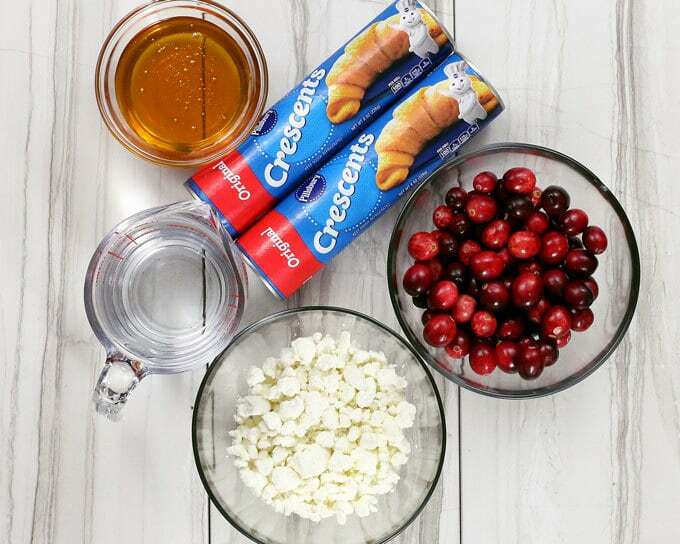 Goat cheese and cranberries sound like the absolute perfect combination. 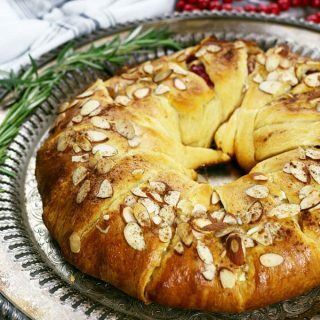 This looks like something to make for the holiday gatherings! This is love food! I absolutely must try it. 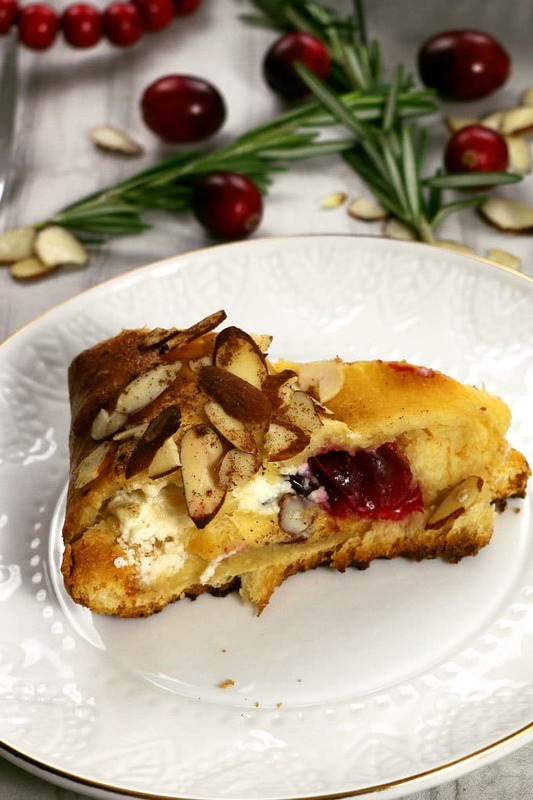 What a gorgeous Fall pastry! This would be perfect at my next dinner party! 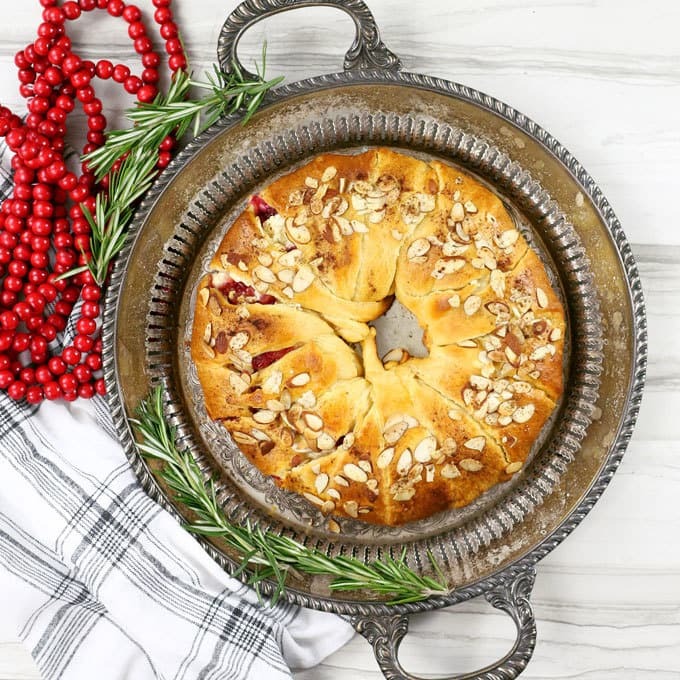 This is a gorgeous holiday dessert that is perfect for entertaining. This crescent ring is gorgeous! I love making rings like this, dessert wise and savory! This would be great for Thanskgiving or even Christmas morning! This looks so FESTIVE! Perfect for our holiday party! Beautiful, festive dish!! Thanks for sharing on the What’s for Dinner link up and don’t forget to leave a comment at the party – Next week’s features that also leave a comment get pinned, yummed and tweeted! This looks amazing! Definitely going to have to try it out! This is just gorgeous! Thanks for linkin’ up with What’s Cookin’ Wednesday! Made this for my family. I literally had to fight to get a piece. It was delicious and a recipe I will be using often !